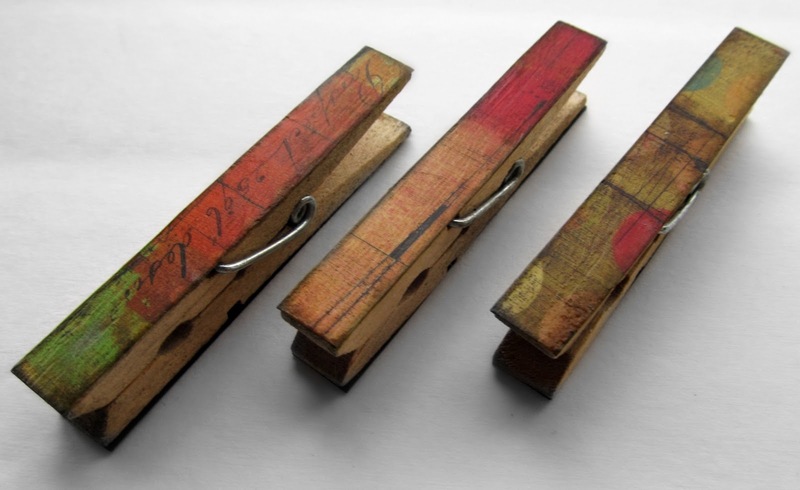 Make an adorable trio of clothespin magnets. You can use them to hang items on your fridge. Or if you prefer, you can leave the magnet off and use them on a wire message board. Gather up your supplies. You will need clothespins, decorative paper, Mod Podge and magnets, as well as glue. Trace the clothespins on your decorative paper. Cut the paper strips out. Coat the clothespin surface with Mod Podge. Use a scrapper to firmly attach and squeeze out the extra glue. Rub the edges of the paper on a ink pad. I used dark brown so it would be contrasting. This is the difference between the inked edged and the plain edge. Inking the edges really adds a finishing touch. Here are the 3 clothespins with inked edges. Trace and cut out 3 magnet strips. Coat the backsides of the clothespins with glue and attach the magnets. I used contact cement because that is what was close at hand. The 3 magnet covered backsides. Coat the paper side of the clothespins with a finishing layer of Mod Podge. Let the clothespins dry and they are ready to go. Then, repeat with various colors and patterns! Love YOURS 🙂 — I adore the paper you used and adding the distressing with the ink pad! I was just getting ready to make some of these to stick on our art cabinet! Yours are so pretty!